1 necklace, 3 bracelets, 3 brooches and 1 pair of earrings. One of the bracelets is made of Art Glass scarabs. AS SOON AS POSSIBLE! Nice classic style. All my jewelry is used and has aged wear including scratches and may need polishing cleaning. •Fine Working Fold-Over Clasp & Safety Chain With Spring Ring. Sorry NO exceptions. • Gold Tone. This is my fault and I will take full responsibility. VINTAGE SARA COVENTRY P SCARAB BRACELET. Very nice gold tone Sara Coventry scarab bracelet. In excellent used condition.It is approximately 7 3/4” long. Nice shiny shows light reflection in photos. All my jewelry is used and has aged wear including scratches and may need polishing cleaning. Vintage Goldtone Gemstone Scarab Bracelet - 7.25”. Shipped with USPS First Class Package. Preowned but never worn. Scarab Bracelet Vintage 6" long with 5 stones great conditon. STUNNING VINTAGE ESTATE EGYPTIAN CARVED SCARAB BEETLE BRACELET CABOCHON STONE 7"
There are no markings on the bracelet looks to be gold filled. We established Jewelicious in 1999 but have been collecting jewelry for over 40 years, primarily purchasing estate sales when living in Southern California, 1978-1999, but also jewelry lots from estates since living in Central Indiana. 2 wonderful gold filled scarab jewelry pieces found together at estate. The bracelet is double link with spring ring closure, 7 1/4" long. Pin is straight and functions properly. I see no issues. AURORA BOREALIS SWEATER GUARD, AVON RING ABOUT A SIZE 6, AURORA BOREALIS RHINESTONE NECKLACE AND BUTTERFLY PIN, MULTI COLORED LARGE SCARABS BRACELET, LARGE RING PIN. Handling cost for this item is Free! Vintage Bracelet Multi gem Carved Egyptian Style Scarabs AVmark 12kt goldfilled 7.5 inches Shipping discount are available on jewelry for multiple items won!!! ~Classic Gemstone Scarab Bracelet. ~12k Gold Filled Bezel Setting. ~Stamped 12k G.F. The clip on one of the earrings it not tight but tried it and it can be worn. I would tighten it to make sure it does not keep falling off. There is tone loss on the back of one.VTG GOLD TONE EGYPTIAN REVIVAL SCARAB BEETLE DANGLE CLIP ON EARRINGS RUNWAY 3”. Stamped 925 for sterling silver carved art glass scarab bracelet. The back of each link is stamped 925 twice. There are 7 different color scarabs in this bracelet. This is a very pretty scarab bracelet handed down from my aunt. I'm not sure if it's gold filled or not, but there's a lobster claw and safety chain that seems to have been added later. The clasp says 14k. 7 vtg/new mix color style necklace lot - Scarab, genuine biwa pearls, cats eye etc. Necklace is 19” long, scarabs are 1 1/4” x 3/4” and is in good pre-owned condition. Vintage Gold Tone Egyptian Filagree Scarab Necklace. It measures 17 3/4” in length. The medallions measure 1 1/4” in diameter. It has a beautiful link chain. It is in really good condition. Very nicely made. A nice item to add to someone’s collection. Shipped with USPS First Class Package. If you have any questions don’t hesitate to ask. I will do my best to answer. I will combine shipping when I can. Vintage Egyptian revival gold tone and gemstone necklace and earrings set. The main drop Scarab is deep red Carnelian and the top scarab is lapis blue Sodalite accented with emerald green jelly cabs in the center. MATCHING STONES. The pendant is 1 3/4"L attached to a 30"L chain. The Pierced earrings are 1 3/4”Long and are the Etruscan style hinged setting. I’ve seen other sets which are identified as Nina Ricci but I cannot find a signature or stamp on the pieces. High end quality- very detailed and in excellent condition. A great addition to any jewelry collection. Shipping in the Continuous U.S. Only. Payment due within 72 hours of Winning Bid or Item will be Relisted. It is set with seven beautiful carved stone scarabs, all set in sterling silver. Wonderful solid. 925 sterling and blue glazed porcelain Scarab pendent with a solid sterling round chain necklace. Total weight is 11.1 grams. Vintage Scarab Bracelet Large Early Plastic Scarabs This is a nice large vintage bracelet marked Germany the Scarabs are nicely colored to mimic real stones. 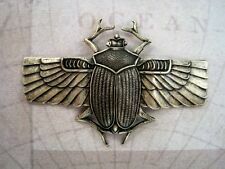 Each Scarab measures 1"x 3\4" the metal I believe is brass. Well made and pretty Shipped with USPS First Class Package. Vintage 14k gold filled Scarab Bracelet 7 1/2" - WRE. Shipped with USPS First Class Package. SCARAB DOUBLE CHAIN BRACELET. 18K gold-filled with safety chain. Stamped on back "WRF". It is marked 1/20 12k gf WRE. It is 15/16" x 5/8" and in very good condition. 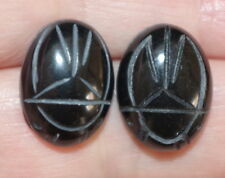 · Seven carved scarab beetle beads. There is a crack on the side of the pink stone, which does not affect its stability in its setting. No other flaws. · Each bead is set in a gold tone trim and gold tone links are set in between. Eqyptian Scarab Bracelet Bloodstone. Double Row. With Chain. The closures are working and usable. Stone(s) Imitation stones. That being said, mistakes can occur. # of Pieces 3. Sterling silver scarab ring sz 7. Shipped with USPS First Class Package. Vintage Brass Stamping / Large Scarab w. 2 Loops /Egyptian Revival / 1 Piece.